A bevy of BioShock content will set you back $30. BioShock: Ultimate Rapture Edition may not quite live up to its lofty name, but it's aiming to get pretty close. If you've been holding off on purchasing the series but want to get acquainted with it prior to the release of BioShock Infinite, Irrational Games is about to make it much easier for you. This $30 compilation will give you access to BioShock, BioShock 2, a host of DLC packs for both, and few collectible goodies to ease your journey from Rapture into Columbia. The two games themselves are pretty well-known at this point. Each entry is a first-person shooter that invites players to explore Rapture, an underwater city founded on the Objectivist principles of novelist Ayn Rand. Where Ultimate Rapture provides the biggest convenience is arguably in consolidating all the DLC in one place. The first game will include the "Plasmids Pack," the "Challenge Rooms Pack" (previously only available on PS3), and a new museum level to explore. 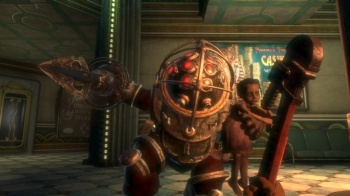 BioShock 2 includes multiplayer content packs "Sinclair Solutions Tester," "Rapture Metro," and "Kill 'Em Kindly," in addition to the single player "The Protector Trials" and "Minerva's Den." Finally, the game will include a number of collectible BioShock Infinite stickers, perhaps for patching pipes on clockwork steam technology. Irrational pegs the additional content's worth at over $40. Many, if not most, people in BioShock Infinite's target audience have already played at least one of the two games, but if you haven't, this is probably the most efficient way to do it. Ultimate Rapture Edition will launch for the PS3 and 360 on January 14, 2013, so that should still leave new players a few months to finish the older games before the latest installment ships. Personally, I wonder how many people plan to pick this one up; would you kindly leave a comment?